Guillermo Del Toro Says 'Shape Of Water' Is An Antidote For Today's Cynicism In the Mexican director's latest film, a mute cleaning lady befriends a sea creature who is able to communicate without words. "The movie is about connecting with 'the other,' " del Toro says. 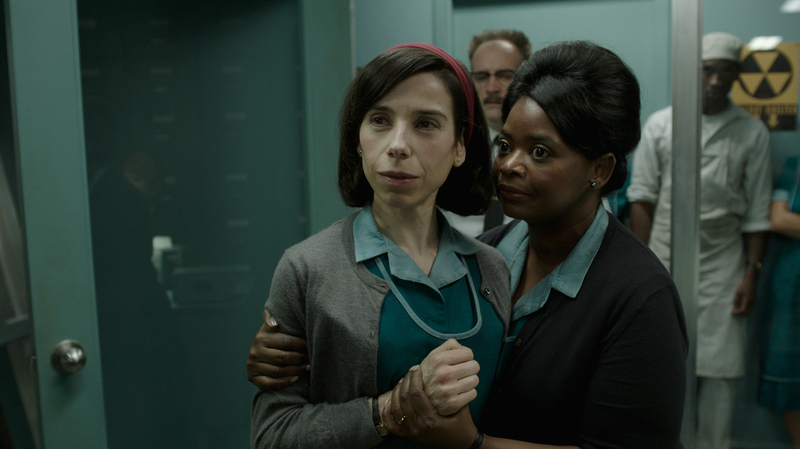 Sally Hawkins and Octavia Spencer play cleaning ladies Elisa and Zelda in The Shape of Water. Mexican filmmaker Guillermo del Toro is known for blurring the line between fantasy and reality. He directed the 2006 dark fantasy Pan's Labyrinth, and in his latest film, The Shape of Water, he once again mixes realistic sets with mysterious monsters. The Shape of Water is set near Washington, D.C., inside a Cold War government lab. In the midst of the space race with Russia, American authorities capture an amphibian sea creature. They plan to dissect it and see if it can withstand being shot into space. While the beast, played by Doug Jones, clearly seems alien, its human-like characteristics are striking. Like the creatures in Pan's Labyrinth, Jones wore a meticulously designed suit and his amphibian man was given slight digital modifications in post-production. Del Toro tells NPR's Rachel Martin, "The beautiful thing about this creature is [it's] sort of the Michelangelo's David of those creatures. He's absolutely gorgeous in every proportion, in every sculptural detail." American and Russian officials are drawn to the monster for its ability to communicate without words. That's also how it connects with the film's mute heroine, Elisa, played by Sally Hawkins. The characters around Elisa, including her friends, spend much of the film talking at her, even though they understand when she signs back to them. But when Elisa is with the creature, their ability to listen to each other is apparent. Elisa (Hawkins) and the amphibian man (Doug Jones) communicate better than any of the other characters in The Shape of Water. "What is beautiful for me is that every single character that has the power of speech has problems communicating," del Toro says. "And the two characters that [do not have] the power of speech — they are mute or wordless — they are actually communicating beautifully." Del Toro says he uses Elisa and the creature's connection as a window to how people should communicate with one another. "The movie is about connecting with 'the other,' " he says. "You know, the idea of empathy, the idea of how we do need each other to survive. And that's why the original title of the screenplay when I wrote it was A Fairy Tale for Troubled Times, because I think that this is a movie that is incredibly pertinent and almost like an antidote to a lot of the cynicism and disconnect that we experience day to day." Like many of his films, The Shape of Water was also informed by del Toro's Catholic upbringing. (Today he describes himself as "lapsed.") The sea creature, for example, was inspired by both Catholicism and fairy tales. "A very Catholic notion is the humble force, or the force of humility, that gets revealed as a god-like figure toward the end," he says. "It's also used in fairy tales. In fairy tales, in fact, there is an entire strand of tales that would be encompassed by the title 'The Magical Fish.' And [it's] not exactly a secret that a fish is a Christian symbol." In The Shape of Water and in Pan's Labyrinth, del Toro also flirts with the idea of an afterlife — even though he doesn't believe in it. "I don't think there is life beyond death, I don't," he says. "But I do believe that we get this clarity in the last minute of our life. The titles we achieved, the honors we managed, they all vanish. You are left alone with you and your deeds and the things you didn't do. And that moment of clarity gives you either peace or the most tremendous fear, because you finally have no cover, and you finally realize exactly who you are."